These skinny berry yogurt cups are an easy and refreshing summer breakfast. Blueberries and strawberries topped with vanilla Greek yogurt kissed with little maple syrup and hint of cinnamon. Perfect when you want something cool and light. They would make a great quick and easy snack or light dessert too. I halved the recipe to make 2 servings instead of 4. I used Greek yogurt instead of regular for the added boost of protein. And I substituted maple syrup for the sugar. You can find the original recipe here at Taste of Home. This is a recipe you can make with whatever fruit is in season. I had blueberries and strawberries in the fridge. Raspberries and chunks of juicy peach would be yummy too. We both liked these skinny berry yogurt cups a lot. I’ve made them for breakfast several times in the past couple of weeks. They’re a perfect accompaniment to these low-fat lemon blueberry oatmeal muffins too. According to my calculations each serving has 105 calories, *3 Weight Watchers PointsPlus, *2 WW Freestyle SmartPoints. Enjoy! If you’ve made these berry yogurt cups, please give the recipe a star rating below and leave a comment letting me know how you liked it. 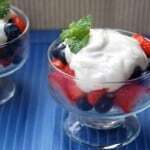 This easy, healthy and refreshing recipe for fresh berry yogurt cups can easily be made with whatever fruit is in season. 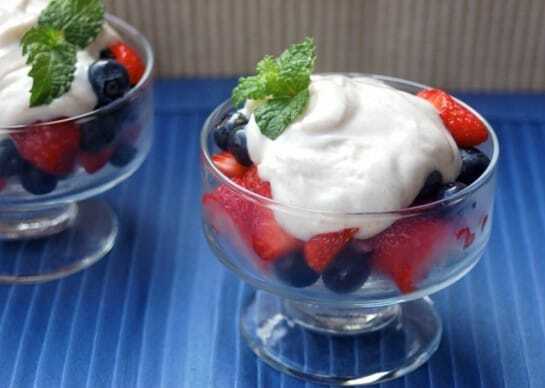 Divide strawberries and blueberries among two individual serving dishes. In a small bowl, combine the yogurt, maple syrup and cinnamon until well blended. Spoon evenly over the fruit.